A trip to Rawai, a beach resort on the island of Phuket, rewards visitors with access to quirky museums, heritage sites, and animal conservation projects. Start off your visit on the 8th (Mon): contemplate in the serene atmosphere at Chaithararam Temple (Wat Chalong), indulge in some personalized pampering at some of the best spas, then take some stellar pictures from Karon View Point, and finally get great views at Nai Harn Beach. To find photos, where to stay, ratings, and other tourist information, use the Rawai tour itinerary planner . Kochi (Cochin), India to Rawai is an approximately 11.5-hour combination of flight and bus. You can also drive. The time zone difference moving from India Standard Time to Indochina Time is 1 hour. In July, plan for daily highs up to 36°C, and evening lows to 28°C. Wrap up your sightseeing on the 8th (Mon) early enough to travel to Bophut. On the 9th (Tue), take in the spiritual surroundings of Wat Plai Laem, then stop by Classic International Suits, and then discover the deep blue sea with a scuba or snorkeling tour. To see where to stay, photos, and other tourist information, read our Bophut road trip app . Traveling by combination of bus and flight from Rawai to Bophut takes 3.5 hours. Alternatively, you can do a combination of bus and ferry; or take a bus. Expect a daytime high around 38°C in July, and nighttime lows around 31°C. Cap off your sightseeing on the 9th (Tue) early enough to catch the ferry to Ko Pha Ngan. Kick off your visit on the 10th (Wed): tour the pleasant surroundings at Thong Nai Pan Noi, kick back and relax at Bottle Beach, and then contemplate in the serene atmosphere at Chao Mae Kuan Im Shrine. Here are some ideas for day two: tour the pleasant surroundings at Salad Beach, contemplate in the serene atmosphere at Wat Chaloklum, and then discover the deep blue sea with a scuba or snorkeling tour. To find traveler tips, other places to visit, where to stay, and more tourist information, go to the Ko Pha Ngan visit planning site . 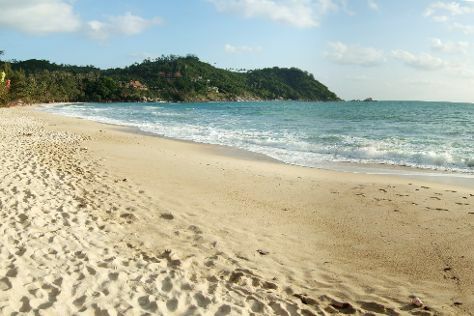 Ko Pha Ngan is just a short distance from Bophut. Expect a daytime high around 38°C in July, and nighttime lows around 31°C. Wrap up your sightseeing on the 11th (Thu) to allow time to travel to Bangkok. Start off your visit on the 12th (Fri): identify plant and animal life at Snake Farm (Queen Saovabha Memorial Institute), then look for all kinds of wild species at SEA LIFE Bangkok Ocean World, and then admire the striking features of Jim Thompson House. Keep things going the next day: examine the collection at Madame Tussauds Bangkok, don't miss a visit to Wat Pho, and then step into the grandiose world of The Grand Palace. To see reviews, more things to do, maps, and tourist information, you can read our Bangkok tour website . Traveling by combination of bus and flight from Ko Pha Ngan to Bangkok takes 5 hours. Alternatively, you can take a bus; or do a combination of ferry and train. In July, plan for daily highs up to 39°C, and evening lows to 30°C. Wrap up your sightseeing on the 13th (Sat) to allow time to travel back home.